The sink is seamlessly welded in for you. This is very hygienic, because no food residue can accumulate in seams. The sink unit also requires little maintenance. Stainless steel cannot rust by itself. Rust formation is always caused by external influences. For daily maintenance, just use a sponge and some detergent. Treat the unit (min.) once a month with Staalfix, Starpolish or Cif cream (available in almost every major supermarket). Apply a generous amount of the product to a damp soft cloth or sponge, rub in the sink thoroughly, and then rinse the unit with water. After that you will have to wipe the tray dry for a while. However strange it may sound, the use of various brands of stainless steel cleaners is not recommended. The same coating that is applied for protection can also stain the surface. Preferably, use Zepp inoxcleaner or Motip stainless steel cleaner. 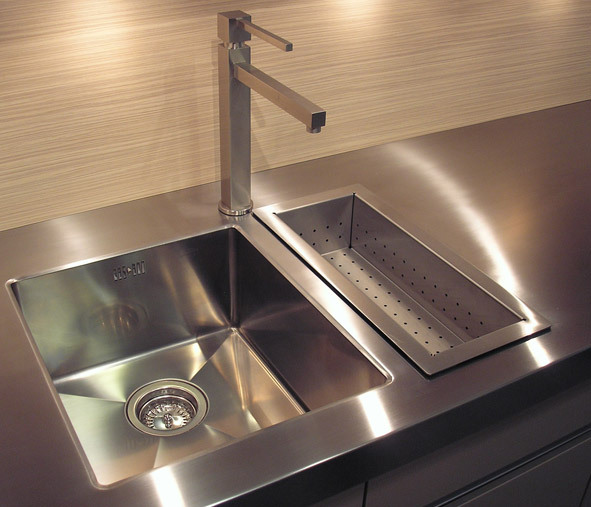 Acids or aggressive substances affect the stainless steel and cause stains, rust spots or small holes in the sink. Examples are chlorine, Sink cleaners, silver polish, dental cleaner, HG cleaner, S39 and hydrochloric acid (solutions). In the unlikely event that there is an aggressive substance in the sink, it is recommended that you should remove it immediately with Staalfix, Starpolish or Cif cream. Again, you will have to rinse the spot with water, and the unit must be rubbed dry. It is recommended to repeat this treatment a number of times. Cleaning only afterwards usually proves useless; the stainless steel is at that moment often already affected, so that the stains will continue to return. Occasionally, the sink may show some kind of corrosion.